This was posted on November 7, 2018 by Sarah Maxwell. Last month, during Aunties’ time, my sisters took some of the littles to a path well-frequented, especially in the mornings by exercise folks and kids going to school. Using chalk, Mary shared the Gospel through Scripture. Even the kids got involved with drawing things, and they were so excited! They all stopped to pray for those who would read it before leaving. May we each make the most of every opportunity to share Jesus! We live on a corner and the local school buses pick up there. 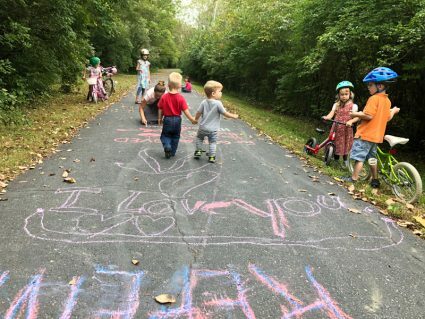 My children and I have done something similar, and it’s such a simple witness! Just a simple “Jesus loves you” message can do so much. I expect your children enjoy doing that. I love the creativity! I think it’s so powerful to get our children as directly involved as possible in purpose-filled activities as spreading the gospel of Jesus! I wasn’t there, but I sure was blessed when I saw the photos and thought about people reading Scripture as they walked by. What a creative way to share the gospel. I pray it gives people pause to think about eternity. 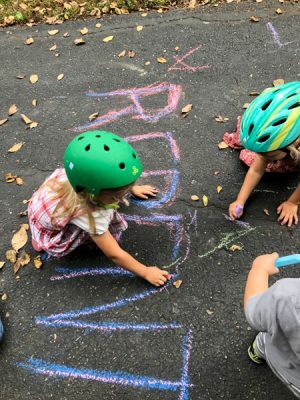 We’ve seen student groups chalk pro-abundant life messages outside of our local Planned Parenthood. 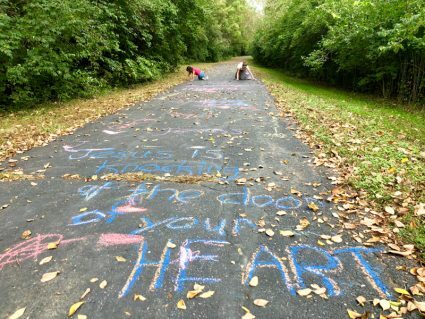 If they do this again, they should consider writing messages and quotes “backwards” so that people can read them as they walk/run along the path. 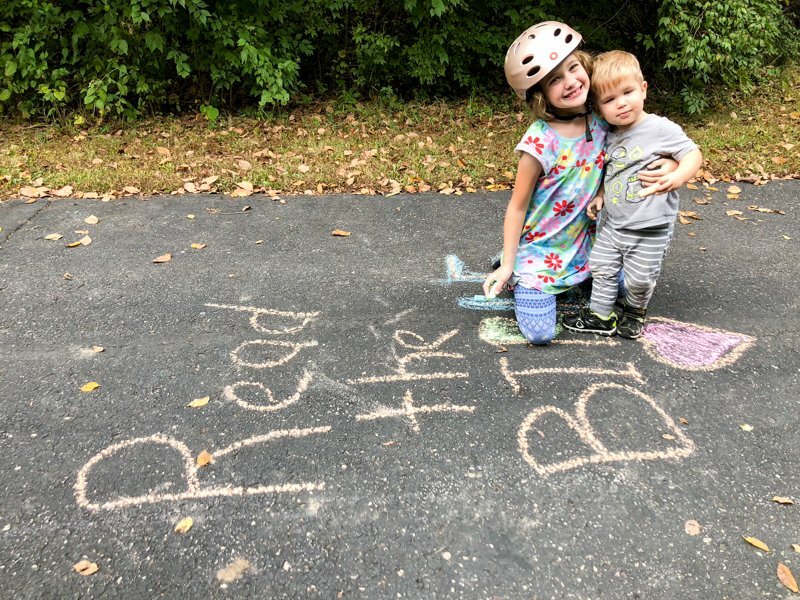 So you see the first couple words, then a few feet later, the next couple of words, then a few feet later as walker progresses down the path, the nest couple of words, etc. 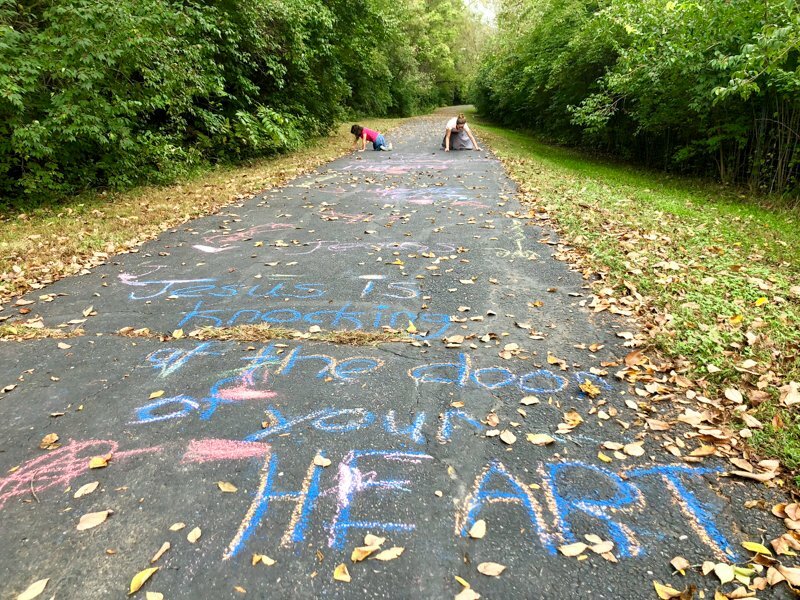 That is how I have seen it done when advertisers or people provide messages along paths and sidewalks. Hope this makes sense! We saw it done that way on our walking sidewalk advertising an upcoming run/race. I love this! What a great way to share the gospel! I expect them to do it again. 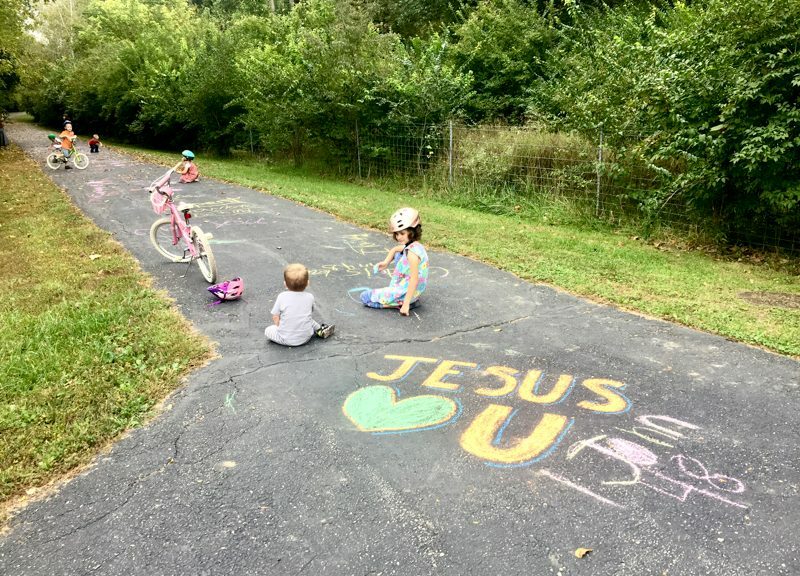 This is such an awesome idea to encourage your precious little children in spreading the glorious tidings of Jesus Christ! Loved the pictures! “Saith the LORD…So shall My Word be that goeth forth out of My mouth: it shall not return unto Me void, but it shall accomplish that what I please, and it shall prosper in the thing whereto I sent it.” (Isaiah 55:11) “He shall be like a tree planted by the rivers of water, that bringeth forth his fruit in his season; his leaf also shall not wither; and whatsoever he doeth shall prosper.” (Psalm 1:3). In the past when I visited one of the Great Lakes near Michigan, I found much joy in writing “JESUS” in the sand where the water. Little witnesses like those and these glorify the Lord Jesus Christ and He can use them to lead lost souls to Himself. 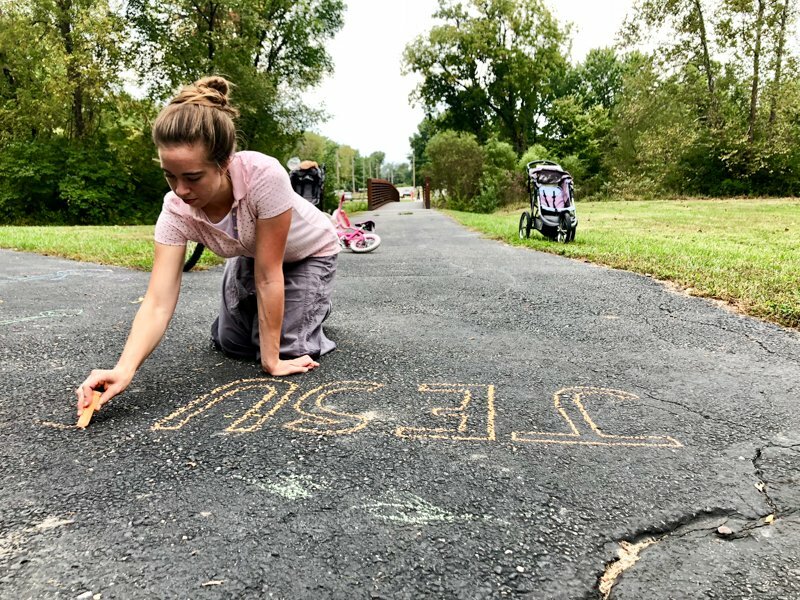 When Storm was much smaller she always loved to use chalk to write messages and scripture on our sidewalks for others to read as they came by. We are leading a young ladies Bible study right now. I’m thinking I will suggest this as a way to begin witnessing to others. That’s very sweet! 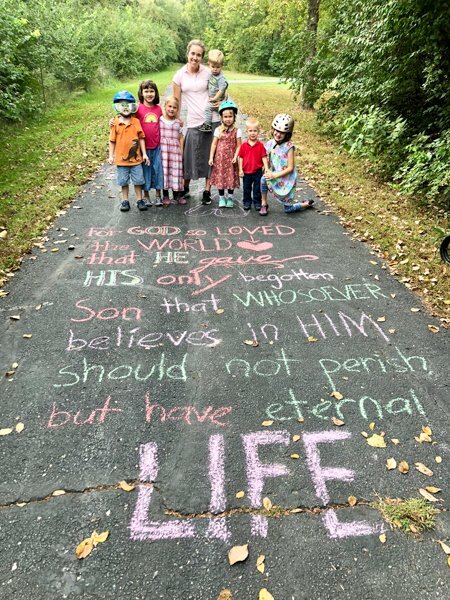 I can just picture a little girl out writing Scripture on her sidewalk to testify for Jesus. Aw that’s so nice. What a great idea! I’m guessing Mary wrote the “for God so loved the world” one?